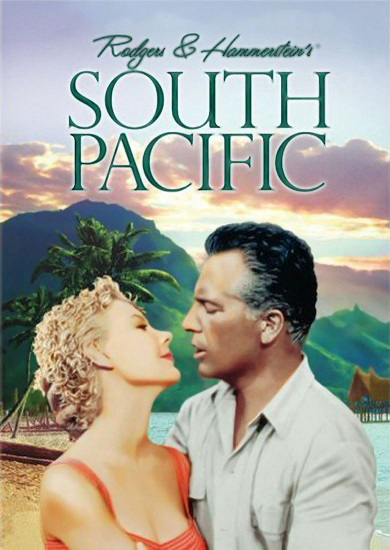 Mitzi Gaynor and Rossano Brazzi star in the breath-takingly beautiful musical, “South Pacific”, the last film in Ogunquit Performing Arts’ Classic Film Series, Sunday, May 6, 2018, 2 pm, at the Dunaway Center, 23 School Street, Ogunquit. Free Admission, parking and popcorn. Ogunquit Performing Arts presents the last film it its 2017-2018 Classic Film Series on Sunday, May 6, 2018, at 2 pm in the Dunaway Center, with the screening of Rodgers and Hammerstein’s” South Pacific.” The visually spectacular musical will be shown on a wall-sized screen, with free admission, parking and popcorn. The much-anticipated film version of Rodgers and Hammerstein’s “South Pacific” made its debut on March 19, 1958. The film stars Mitzi Gaynor, Rossano Brazzi, John Kerr, France Nuyen, Juanita Hall, and Ray Walston, and was produced by Buddy Adler and directed by Joshua Logan for Twentieth Century Fox. All the wonderful songs from the original stage musical are captured in this film, including “Some Enchanted Evening”, “Younger Than Springtime”, and “I’m in Love with a Wonderful Guy”. The original musical, also directed by Joshua Logan, was adapted from James A. Michener’s Pulitzer Prize-winning novel Tales of the South Pacific, an account of some of the author’s experiences toward the end of World War II. The musical opened at the Majestic Theater on April 7, 1949, and ran for 1,925 performances, until it closed on January 16, 1954. Wanting to protect their work, Rodgers and Hammerstein had long since decided to produce the film versions of their great shows themselves, starting with Oklahoma! in 1955. Since each film received their personal attention, by the time they started working on “South Pacific” in1957, they couldn’t use the show’s original leads. Although many thought Mary Martin too old for the role by then, they would have used her if Ezio Pinza hadn’t died. With his passing, they didn’t think there was an actor strong enough to hold his own as her love interest. Ultimately, the only member of the original Broadway cast to make it to the film was Juanita Hall, who had won a Tony for her performance as Bloody Mary. The film’s only other actor who had done “South Pacific” on stage was Ray Walston, who had played the comic character Luther Billis in the touring company and in London. With Logan signed to direct, the search was on for the leading lady. Many were considered, including Doris Day, Audrey Hepburn and Elizabeth Taylor. The role of Nellie Forbush finally went to Mitzi Gaynor, a contract player who had earlier starred in a series of musicals for Fox. Although inevitable tough comparisons to Mary Martin were made, Gaynor turned out to be an inspired choice and turned in a solid, professional and engaging performance. She was also the only one of the four leads to do her own singing. Other voices were found and dubbed for almost everyone else in the cast, even including second lead John Kerr and Juanita Hall. The biggest vocal disappointment came from suave, Italian leading man Rossano Brazzi, cast as Emile de Becque, who had insisted that he could sing the role himself. But when Rodgers and Hammerstein heard him, they sought out and found the gifted Metropolitan Opera bass Giorgio Tozzi to record the songs. When Brazzi heard the playbacks of Tozzi’s beautiful performances, he was none too pleased and initially refused to lip sync to them. His rebellion subsided however when it was made clear to him that it was lip sync or leave. The filming of “South Pacific” was a huge logistical undertaking, involving the cooperation of the US Defense Department and hundreds of extras. Some shooting was done in the Fiji Islands, but the main location was the idyllic Hawaiian island of Kauai, where four shiploads of technical equipment and a crew of nearly two hundred joined the cast. Don’t miss this gorgeous film, “South Pacific”, on Sunday, May 6, 2018, at 2 pm at the Dunaway Center, 23 School Street in Ogunquit. The film is shown on a full wall-size screen, admission, parking, and popcorn are free! Mark your calendars for the first film in our 2018-2019 Series, “The African Queen” on Sunday, November 4, 2018 at 2 pm. Have a good summer – we’ll see you there!